Lola Preis Sylman and Jakob Sylman at a reunion of Chmielnik's Holocaust survivors in Miami Beach. 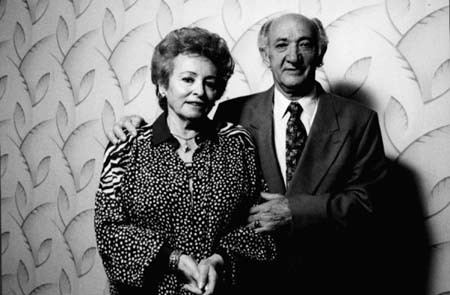 Jakob fled Chmielnik after Germany's invasion of Poland. He survived the war with a few relatives working as slave laborers in the Soviet Union. Lola, originally of Staszow, was enslaved in Hasag's ammunition factory in Kielce with Bela and Regina Garfinkel. During the transfer of Jewish prisoners farther west, Lola ended up in different camps in Germany. ©2003. Design and hosting by Cyberian Management Group, Inc.